The Fraser Explorer Tour takes you around all of the highlights featuring quality and a personalised experience with small group numbers! Your itinerary will take you from rainforests, to freshwater lakes and amazing coastline of the 75-Mile Beach! Enjoy your fun-filled day from on board a comfortable 4WD! Short on time but don't want to miss a thing? The 1 Day Premium Fraser Explorer Tour is a perfect choice! Including informative commentary from your driver as well as comfort and quality, this premium day tour comes complete with a la carte menu at the Eurong Beach Resort! Perfect for those who want to escape the crowd and enjoy a little bit extra. Sit back and relax as your guide takes you around one of the most magnificent islands in the world. You have found the premium day tour of Fraser, offering the highest quality and sights of the island. The Pinnacles - Stop at this natural phenomenon to grab some pictures! Eli Creek - Bring along a floatie and enjoy the creek at its best! Depart: Tour departs daily from Hervey Bay to River Heads for the 8.30am barge crossing to the Wanggoolba Creek landing on Fraser Island. Return: Tour returns from Fraser Island on the 5:00pm barge back to River Heads before transferring you to your Hervey Bay accommodation. 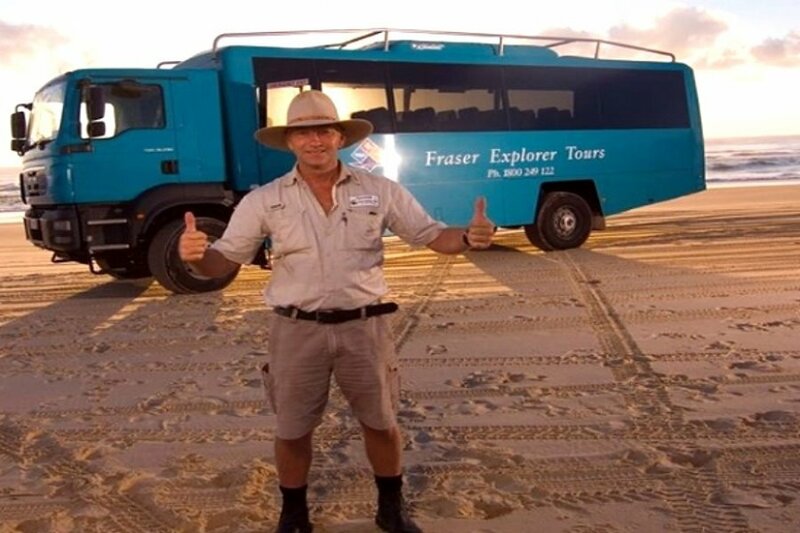 Tours also available from Rainbow Beach, please enquire. Children under 7 must travel in a forward facing car seat. Passengers must bring their own. All ages are welcome and children ages 0-3 years travel for free.